How small steps towards staff autonomy lead to wide-scale improvement. Published outside the USA as Erasing Excellence: Examining the grip of centralised power, this US edition is a cautionary tale that emphasizes the positive effects of allowing people to find their own solutions to their own problems and illustrates the fragility of dispersed power. 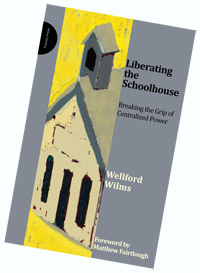 In Liberating the Schoolhouse, Wellford Wilms tells the story of Baldwin Park High School, California. In 2002, pupil attainment and attendance were low, teachers were demoralised and disempowered and discipline was poor. By 2006, student absenteeism and the number of disciplinary cases had fallen dramatically and test scores had achieved near triple-digit gains. This change was brought about by a new principal and her small leadership team. By taking small steps to hand teachers autonomy both in and outside of the classroom, they were able to improve performance across the whole school. When, in 2006, the district replaced the principal with someone more willing to toe the line, staff motivation slowly but surely ebbed away in the face of top-down command... Empowerment returned to inertia. The lessons learnt by examining the case of Baldwin Park High School could apply to any school or organisation - not just in the USA, but anywhere in the world. Where members of staff are encouraged to take ownership of the decisions that affect them, they act with the bigger picture in mind. The results can be far-reaching. Invaluable reading for all those involved in the mainstream education debate and for anyone with a suspicion that there must be an alternative to centralised power.